Do you love to bake breads, make your own pasta, or cookies from scratch? Then, you should be well versed in the world of rolling dough. Some use more primitive utensils for rolling their dough such as a cylindrical glass or even the edge of a pot, but if you do this often, consider purchasing a dedicated dough roller. Rolling pins have been used for millennia, and nowadays, there are many types of pins to choose from that will make the process of rolling dough evenly a veritable cinch. We’ve compiled a list of some of the better pins on the market, a budget conscious version as well as some points to consider before you buy. Organic processes are gaining in popularity. Chef’s Organic Gadgets has made it their goal to produce high-quality kitchenware eco-friendly and organic kitchen gadgets that also revolutionize your meal preparation. Their stainless steel rolling pin is our Gold Pick because it is a versatile, feature-rich, and most importantly, useful rolling pin that would be at home in anyone’s kitchen, from the neophyte chef to the professional. To start, as the name suggests, this rolling pin is comprised of stainless steel and is a French-type rod(more on rolling types in the pre-purchase considerations section). Along the ends are two removable, neon-green knobs that allow you to add on three different sized rubber discs. These discs allow you to adjust the height of the rolling surface, so that you can pick the thickness of the dough that you are flattening. These discs allow you to measure dough heights in increments of 2mm (1/16 inch), 6mm (1/4 inch), and 10mm (3/8 inch). These gray-colored discs can also be removed to ensure a more traditional French rod style of dough rolling. Simply put, accuracy in baking is imperative for delicious uniform delicacies. Your final results will always be affected by dough thickness, width, and even length before cooking. As a response to this need for precision, accurate measurement is at the core of this stainless steel rolling pin; not only does the discs ensure exact thickness, they also provide a limiting edge in order to establish a precise width for the dough itself. In addition to this, there are also precise measurements inscribed directly onto the barrel of the rolling surface itself. These are there so that you can measure the exact width and length of your pastry sheet. With so many ways to ensure that your dough is perfect, your baking results are sure to be satisfying. Since the barrel is comprised of 18/8 stainless steel, this rolling pin is very easy to clean. Once your job is done, it can be thrown in the dishwasher or washed by hand without worrying about damaging the pin itself. This metal composition means that you can cool the pin in the fridge in order to reduce heat transfer to the dough. You can even toss it in the freezer for a short time, and the two plastic ends will help protect your hands from the frigid surface temperatures that result. As a building material, marble has been used far back into prehistory. It’s heavy, smooth, and due to a low rate of refraction, has a waxy look that many find attractive. Constructing axle-style roller out of this material is a fairly new thing, but the weight and durability out of this stone has provided ad entirely new experience to cooks worldwide. Our Silver Pick is one such rolling pin and is of the roller type that has independent handles along the side. Designed by American cookware producer Cook N Home, this pin is an excellent choice for chefs who want excellent balance and smooth rolling. The first thing that you might notice on the pin is the stone rolling surface. The marble is white with grey veining throughout the surface. It is well-cut and shiny and has two and it has two four inch long handles on each side that are tapered for an ergonomic and easy grip. These types of rollers are always beautiful to look at, which is part of their value, but another great feature of this is the ability to cool it in your fridge, in order to reduce the heat being transferred to your dough. The rolling surface is an even ten inches and since marble is a weighty material; this roller is weighs a full five pounds, it’s really best to utilize this type of roller on baked goods that aren’t very light as the extra weight will make the dough too thin. With wood rollers, the natural texture of the wood can greatly affect the surface of your rolled dough. As this marble is cut and polished smooth, this material allows for the elimination any transferred imperfections in the dough. Just remember that since marble is such a notoriously tough substance, it’s best to not cut the dough directly on the surface of the roller as that will dull your blades considerably. This roller is best cleaned by hand and isn’t really recommended for the dishwasher. For our next two rolling pins, we’re returning to the classics. Both are wooden and both offer a bevy of functional features for any level of skill. Our Bronze Pick has been produced by 72 year old company JK Adams. JK Adams specializes in quality hand-crafted cookware that ranges from wooden cutting boards to champagne glasses. Their maple rolling pin is a great, classic-styled roller that incorporates old-style design with some great modern construction. The first thing that you’d notice about this rolling pin is the fact that the handles are stained and the rolling surface is not. This treatment ensures that the handles are easy to grip and are slip resistant. The wax on the barrels also protects the wood from wear and tear. The roller is 12 inches long and is around three inches in diameter. The handles are four and a half inches in length; a perfect size for nearly any sized hand. Altogether the entire rolling pin is 21 inches in length, handle to handle. Underneath the large roller, the axle of this pin is crafted of ultra-strong steel. This axle also features self-lubricating bearings that ensure that this pin will last through a lifetime of heavy use. Since this is a thick cylinder of maple, you’d expect a lot of weightiness with this pin. This is not the case; this pin only weighs two pounds, which is a perfect size for rolling dough that requires a lighter touch such as phyllo dough. Many users report that the axle rolls very smoothly and gives the appropriate amount of resistance when rolling. Since this is a wooden roller, it’s recommended that you not use this pin in the dishwasher; it should be hand washed primarily. While these items aren’t incredibly expensive, they could be prohibitive, especially if you are ballin’ on a budget. 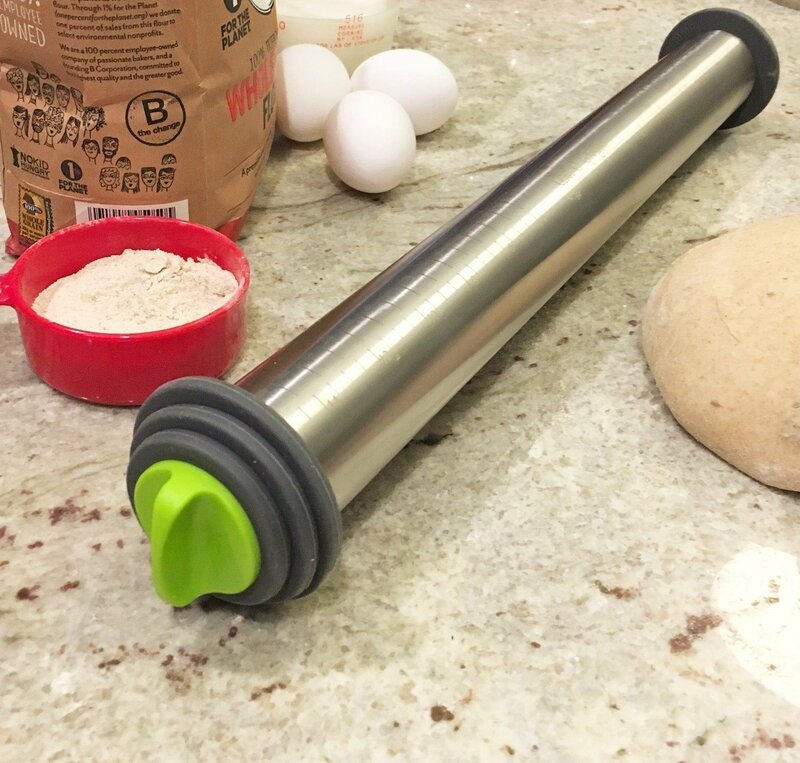 If you need to supply an industrial kitchen with several, low-cost, yet high-quality rolling pins or you just want a very functional and reliable rolling pin without spending a lot of cash, then Good Cook has produced just the rolling pin for your needs. It bears the “classic” moniker because that’s what it is; a classic wooden rolling pin that is well weighted, rolls evenly, and will perform well for years. To start, this item is as nondescript as a rolling pin can be. All the surface is un-waxed, untreated wood and matches perfectly to any décor due to its simplicity. The roller measures around ten inches long and around two inches thick and the handles are about three and a half inches in length a piece. Each handle sports a hole for easy storage, and in general, the rolling pin is small enough to store in most kitchen drawers. The pin is constructed of hardwood but is not very heavy at all; the pin weighs only 11.2 ounces, so you might have to apply more pressure to dough types that need it. Also, many reviewers have found that this pin doesn’t stick to the dough much, which is a standard downfall of wooden-type rollers, so this is a major plus. As this is hardwood, it isn’t recommended that you place this pin in the dishwasher, but being a relatively small profiled pin, you can hand wash it very easily. The rolling mechanism is spins very easily, and there is more than enough clearance around the handles to avoid getting “dough hands”. There are two main types of rolling pin to choose from. Firstly, there is the French rolling pin, also known as a rod. This is typically a uni-body, tapering piece of wood that you simply roll along the dough. For this type, your hands invariably touch the dough itself; an experience which many enjoy and consider an important part of the baking process, but this body warmth also can minutely heat the dough, which is not necessarily a good thing. For this type, it’s best to roll quickly so as not to transfer too much body heat. The second style of rolling pin is the roller. This is the kind that many Americans know about; it’s comprised of an axle and a rolling block that’s typically made of wood. You place your hands on the axle handle bars and roll across the dough. Your hands don’t touch the dough typically, but there is not as much transferred force, so for this type, you’ll use more pressure. 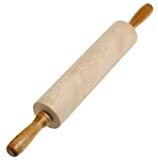 So which do your prefer; the French rolling pin or the roller? This is something that you as a chef will have to decipher for yourself, and it should factor heavily in your choice for your next rolling pin. • Wood – This is the most classic material. Wooden pins date back to distant antiquity, and the first wooden pin with an axle originated in the United States when freed slave Judy W. Reed invented the item in 1884. 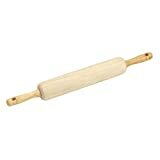 This is a great type of rolling pin, but remember, most woods can stick to the dough meaning that you’ll need more flour to make this type non stick; too much flour can cause trouble with the recipe. • Marble – Marble dough rollers are relatively new. This type is just a axle roller-type but uses marble rather than wood. Marble tends to be cooler so using these, especially after putting them in the refrigerator will help you keep the dough nice and cool before baking. As a result of their marble make-up, these types are heavier and take more control to roll the dough without applying too much pressure. • Stainless Steel – Another recent style of roller. These can be a French style or a roller style of pin. Like marble, these can be cooled to reduce thermal influence on the dough. Some can even be filled with water to make them cooler. This is also a downside as these types can be downright cold to the touch. • Glass – Many of these types of pins can be filled with water. Too cold liquids in this type will cause the glass to perspire, and that extra water will transfer directly into your dough. • Non-Stick – Some rolling pins are comprised of non-stick materials such as plastic or silicone. Since these are light materials, you’ll have to adjust your pressure accordingly as these types don’t have much heft on their own. One great benefit of this type of pin is how easy they are to clean. Make sure your prospective rolling pin is well-balanced. Uneven pressure on the dough you’re rolling can cause irregularities in what you are preparing. When it comes to balance, wood and marble tend to win out as they are the heavier types, but other types of rolling pin compositions can be well balanced too. Just be sure that you are applying even pressure to whatever you’re rolling and your pin is up to the task. There are definitely bonuses to chilling a rolling pin that is composed of marble or stainless steel. As a rule, you don’t have to chill the glass types as they usually need water for a cooler temperature. Chilling inhibits heat transfer to the dough and will make it harder for your dough to stick to the rolling surface. Just be warned, chilling a rolling pin can be uncomfortable on the hands. Since rolling pins come in a variety of styles and material types, cleaning them can be a complicated matter. For the most part, you don’t want to put marble or wood-based rollers in the dishwasher unless they are treated for such cleaning. Metal, glass, and silicone types can typically be placed in your dishwasher, but be sure to consult the manufacturer’s instructions before you machine wash your roller. As a rule, one-piece style French rods are easier to get very clean because they are just one solid piece of material. These types are also typically easier to maintain as there are no moving parts. Rolling dough and crushing cooking items are made much easier with a great rolling pin. The items that we covered in this review covered both types; French rods and standard rollers, but there are many types of these items on the market today. These are definitely some high-quality units, but take time to decide for yourself which kind of rolling pin is best for you and take into account our pre-purchase considerations when doing so. In any situation, when you select your rolling pin, if you follow our guide, there’s one thing you can be sure of: you’ll produce some excellent quality baked goods.